…This time, Bale bombed through from deep, space opening up before him. He played the ball wide to Marcelo and the return ball was perfect. “On a plate,” Bale said. From four yards he scored, left-footed. That fact turned out to be significant: he’d already got one with a header and another with his right foot, meaning that he had completed the “perfect hat-trick”. It had taken him 13 games to get one. The Spanish football statistician “Mister Chip” pointed out that Cristiano Ronaldo had taken 62 games to get one. Leo Messi never has. AS declared him the “Principe de Gales”, the Prince of Wales. Marca went one better and called him the Principe de Goles, the Prince of Goals. Other headlines declared him “Commander Bale”: in the absence of Ronaldo, he had taken on the responsibility, earning his stripes. Even if Marcelo did insist “you can’t compare Bale to Ronaldo”. …In the last six games, Bale has scored eight and provided six assists. In total, he has nine goals and six assists in all competitions. On average he is directly involved in a goal every 56 minutes. 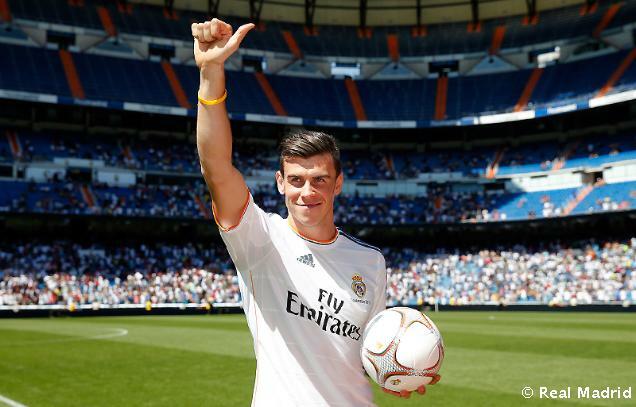 … Bale means “worth it” in Spanish and he is looking increasingly worth it, even £86m. There is an expectation that he will get better too. As he settles, he may become more dominant. For now, he has a key advantage: the physical difference between Bale and the Valladolid defenders was startling on Saturday night.